When I was little and my mom would ask me to do a chore, I remember protesting. My brother and sisters did it, too. I guess that is nature of kids, more fun, less cleaning. If my old Uncle Dominic was around to witness this, he would always say, "It takes longer to talk about it, than it does to do it." As I got older, I realized that he was not wrong and today, his words came flooding back into mind when I looked at my tattered and painted old milk can. It was in need of an update, one that I had talked about doing for years, but obviously never accomplished. I picked it up for about $5 at a garage sale. It was already painted red, a bonus, weathered and scuffed up. In other words, it was perfect. However, as time has passed, I have felt the need to add something to it, to call attention to its prettiness. I wanted it to really stand out. I knew that stenciling it was the way to go, even had one picked out that I picked up at Michael's (with a coupon, of course). I talked about doing it all the time, but ugh, I would have to get out the paints, blah, blah, blah. It just never got done. Then today, I decided to just do it. It took me all of about five minutes. It's still nicked and scuffed, but that's part of its vintage charm. I wiped the can down to remove the dust and taped the stencil to it. I am a lazy painter and not a perfectionist, so I put some white paint on a piece of paper and quickly patted the paint over the stencil with a foam brush. I removed the stencil and I was done. Or was I? You see, now that the can had been adorned, the grey planter sticking out of the top looked even more terrible than before. I wasn't going to remove it, because it fit the space and the plants were thriving. Filling that whole can with dirt is unnecessary and finding a better fitting option at 8am was not happening. I grabbed some red paint and using that same foam brush, I covered the plastic awfulness. Next season I'll buy a more appropriate pot. Or maybe I'll just talk about it for the next few years. Are you more of a talker or a doer? What do you think of my old milk can now? 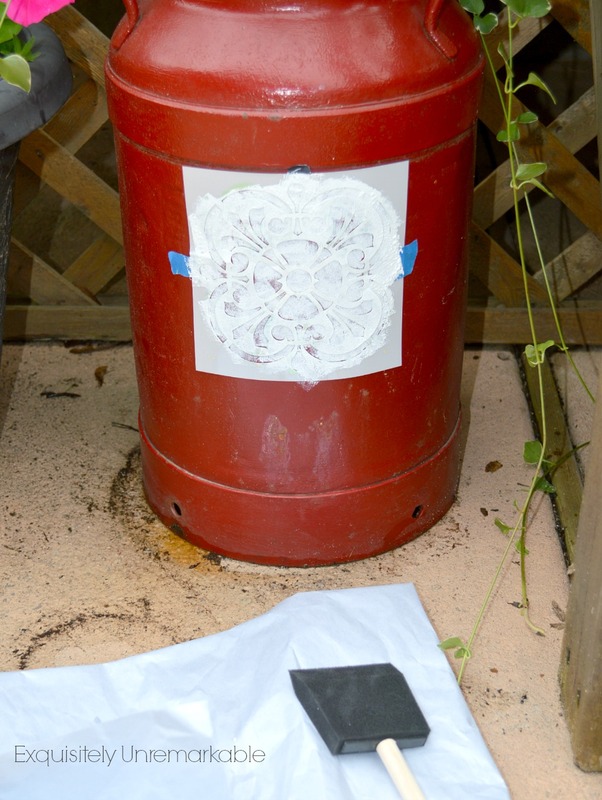 Here are some more stenciled projects! I'm a little of both I guess. I love the red and the stencil! I think it's adorable! I love that you are not a perfectionist painter. I was the same way with a crate. I am using it for the wedding and it was just wood. I just didn't want to take the time to paint it. Finally yesterday, I painted it and I couldn't have spent more than 10 minutes. I then stenciled the wedding date on the site. It looks great and I questioned why I waited so long. I bet it looks great, Carol, and you’re glad to have it behind you. I have one too in black, and your making me want to paint it too! 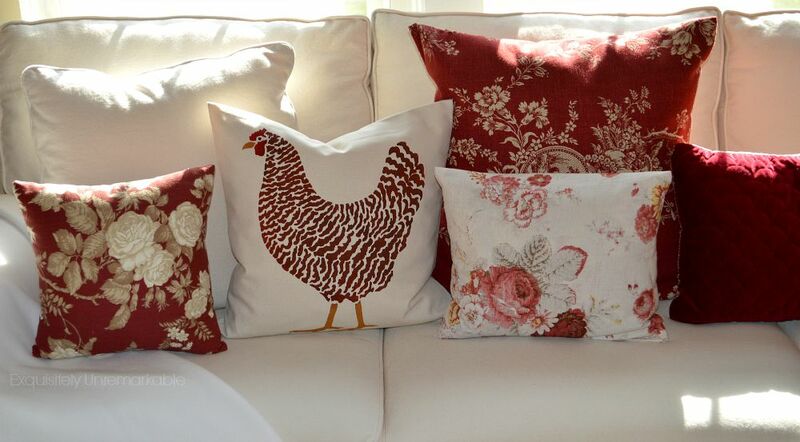 Love what you did with yours with Kim's signature red and pretty stencil! It was so easy, Vel, do it! :) I actually saw one recently on Hometalk with the house number painted in white on the black can. Stunning. Looks great Kim. Love the red and your stencil skills are fabulous!!! Hi Kim, looks fabulous. Love the red and the stencil makes it prefect. Makes me wish I still had my old milk can!! 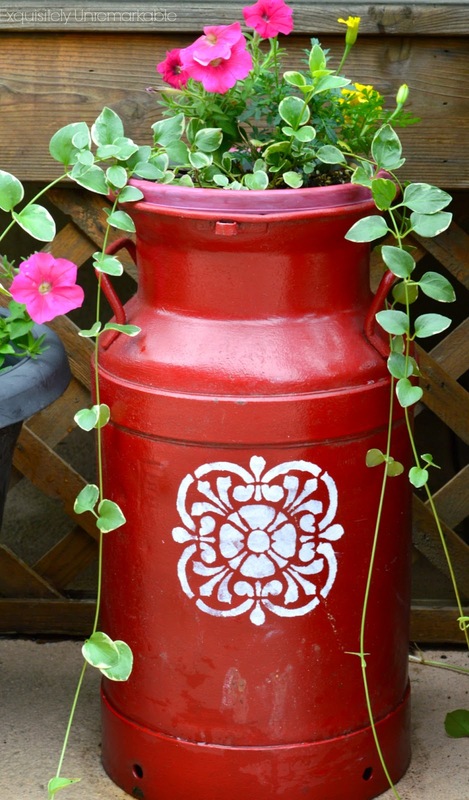 I love your milk can all stenciled so pretty! I have recently resurrected my love of stenciling from the '80's and will stencil anything I can get my hands on! 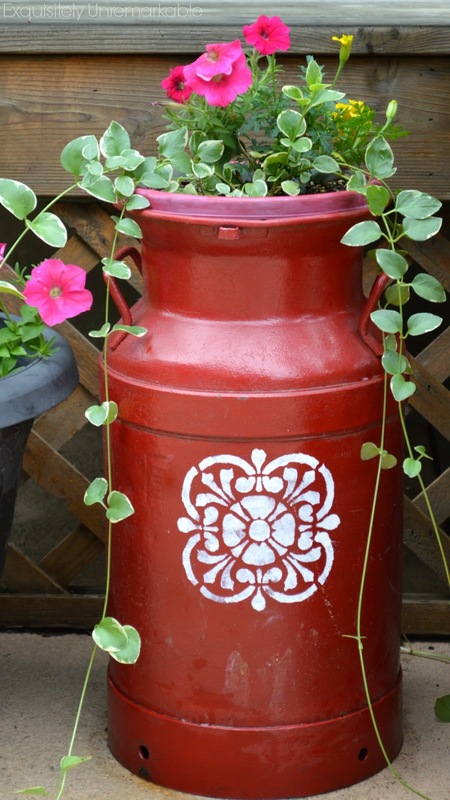 I have 3 large milk cans.....what a perfect canvas to stencil on! I used to stencil everything, AnnMarie! I did bedding, walls, pillows, you name it. I dropped it for a while, too, but I think you're right, it's making a comeback! I'm like Brenda...a little bit of both. 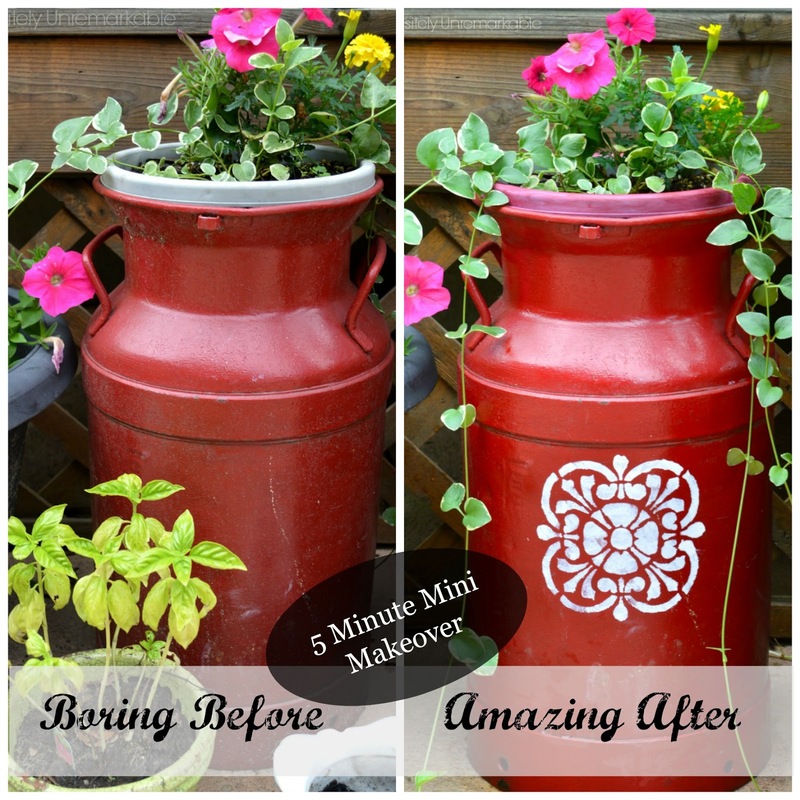 Love the milk can with the stencil and you know I'm all about a quick and easy DIY. This is just the sort of redo I love seeing---when it's 'good enough'! I'm pretty good at following through on my plans because I don't do a lot of projects and the ones I do are usually not difficult or time consuming. I love the bright, shiny red you used and the stencil is darling. Bravo! I go in spurts. I talk a while then get a lot done. Unfortunately, my talking spurts last longer than my doing ones! I love the can. Red is such a great color to add to the garden. That sounds a lot like me, Jenny. Once I accomplish one project, I get motivated to do others. I'm glad you like the red, it's kind of an addiction! 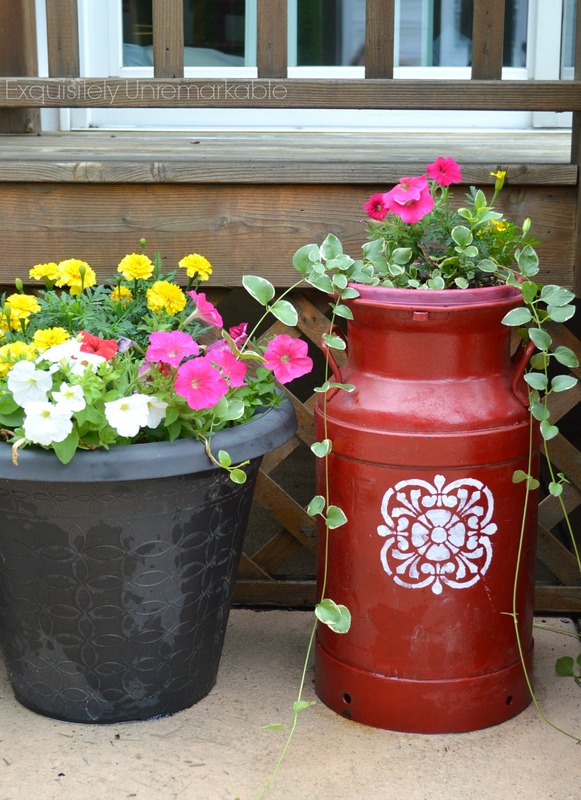 Hi Kim, wow you did a great job stenciling the milk can and the flowers look so pretty! Thanks Julie! I really like the way it came out...and it only took me 5 minutes! It looks great but I am laughing because I'd have never noticed the gray planter part until you mentioned it :) I was busy looking at the pretty stencil work ! I like stencils, too, Maria. I had forgotten how fun they could be! Thanks for the visit today! And you certainly show the wisdom of it, by your great milk-can-planter do-over. And now, you get to smile, every time you set eyes, on it! Yes! I do! :) Thanks! Thanks Jan! I hope they bloom a bit more, it's been a slow start around here! I find that the older I get, doing things around the house becomes less and less important. I would rather be doing things at the beach or with friends. When I finally get to them, though, I am happy...and thanks! It was an easy one. It looks beautiful....love the stencil and the gorgeous flowers! 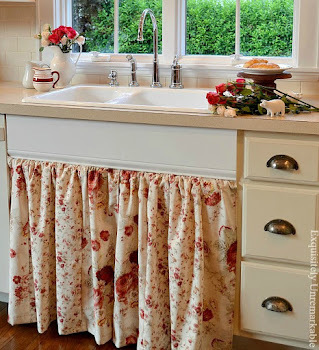 Great way to solve the effect of rim of the pot....I do things like this too, and it is always nice to find a 'work around' rather than start a huge (unnecessary) job! Thank you so much, Helen! I’m definitely a ‘work around’ kind of gal! ;) Thanks for the visit! What a difference the stencil makes. And just that touch of color on the flower pot makes it disappear. What a wonderful mini makeover! Thank you, Kathy! It was super easy, super quick and absolutely free! It turned out lovely, Kim! Thank you Julia. It's simple, but it works! ;) Thanks for the visit! 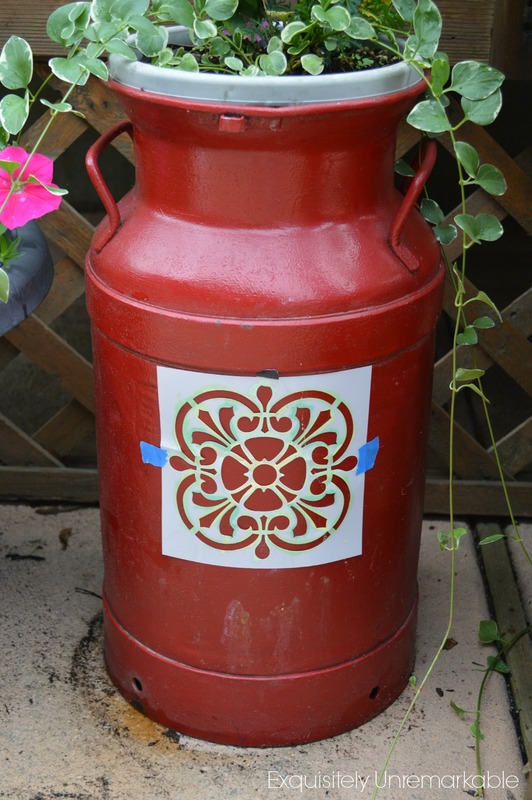 Oh, I love the old red milk can, and your white stencil addition is perfect! I think your painting over the grey pot is great too! I love the two-tone red shade... and your plants look so happy spilling out of the pot.... I tend to think about things a long time too before doing them... lol! 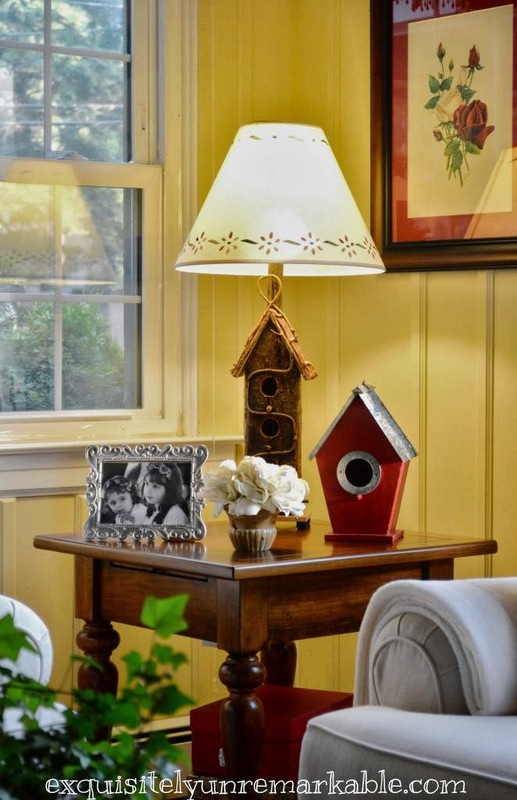 I really like your style and love the red you add to your home, and outdoor decorating. It simply makes me smile. Thank you, Carla. It’s an addiction really, but that’s ok, it’s pretty harmless! ;) And it makes me smile, too! What color red is this? It's not too bright and not too orange--just right. Thank you so much and I wish I knew Trish, I bought it already painted. I adore old milk cans, and your update came out beautiful. Well aren't you glad you got er done? And that luscious red is a show stopper!! Thanks for sharing with SYC. Haha! I'm a talker, but also a doer. Depends on my erratic energy level. I like doing, I just don't always feel up to it. Lovely makeover, Kim! And I hadn't even noticed the red-painted flower pot till you mentioned it! Good idea! VERY cute! Love the stencil! Good idea to paint the gray pot red too. It just blends in. Your milk can looks great. Love the petunias and vinca also. I have a black, rusty lidded milk can with a faded gold eagle on it (bought it this way) and need to paint mine. Perhaps I'll get on it now that I've seen how clean and shiny yours looks! I say get the paint, Barb! It was so easy to do and even with a little bit of rust, it still looks great. Good luck! :) Oh...and thanks!! Lori April 25, 2017 at 4:30 pm....I just finished painting my old milk can red also...then I put a round glass on top for out drinks, etc....will surprise my neighbors tonight!! 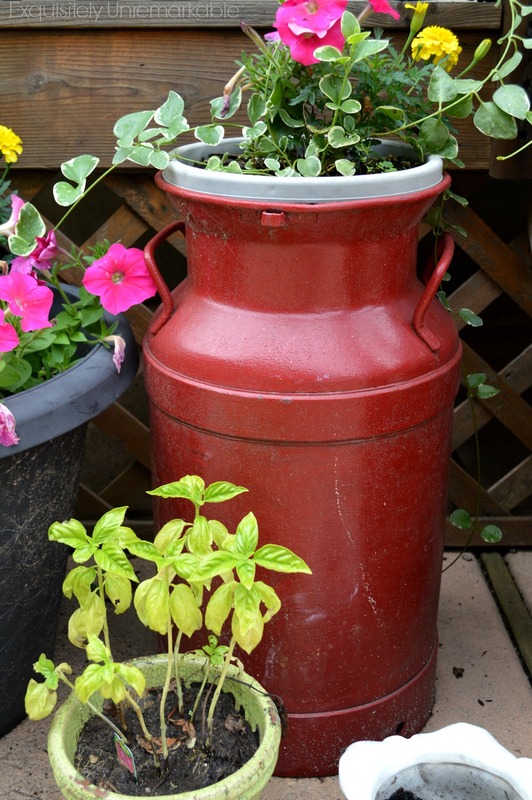 Oh, I also planted the milk can cover...and attached it to the side!!! That sounds amazing!! I think I need to get myself another milk can and make a table like yours!! Fabulous! Thanks for sharing your idea with us! Say what?? You painted paper and then smooshed it agai st the stencil with the foam brush?? Brilliant! I must try that. 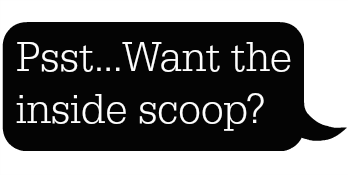 To answer your question, I'm a talker and then I get into a doer spurt for about one project, and starting another that promptly gets pushed to the side when i run into a snag. I have a pile of projects that need to be finished, Nancy...I am talker too! I love your jug, its a great buy! its one of my favorite thing to do is used these container for plants and flowers. It was a very lucky find, Maria! If I went looking for one, I would never have found it.